Both Dr. Mirkin and Dr. Schatz recently came through the University of Michigan Chemistry department to give seminars. The most recent fruit of their collaboration has been published in Nature Nanotechnology and describes how large lattices of gold nanoparticles spaced out by tightly controlled lengths of DNA interact with beams of light. These materials function on the basis of plasmon resonance. Before we dive into plasmons, it's helpful to understand two seemingly unrelated things. First, electrically conductive materials like metals don't hold on to their electrons very tightly. As a result, the electrons are free to move around through a metal particle in response to external forces, such as heat or an applied voltage. Secondly, light is electromagnetic radiation. Physically, that means that light is composed of an electric field and a perpendicular magnetic field, both of which are swinging back and forth in direction. So, what happens when we put a metal nanoparticle into a beam of light? In the dark, the electrons within the nanoparticle are undisturbed. When we turn the light on, the nanoparticle experiences a field of electromagnetic radiation. The electric field - a voltage, essentially - passes through the nanoparticle. Remember that the electrons in the particle are weakly held, so they move along with the electric field towards one end of the particle. As the electric field changes direction, the electrons go with it. You are feeling sleepy... veerrry sleepy... original .gif via gifmaker.me. Now we have a situation where the electrons are oscillating back and forth within the particle, which causes changes in the light beam. The light transfers some energy to the particle as it drags the electrons back and forth, so an absorptive feature - called the plasmon resonance - appears at a particular wavelength. It's important to note that plasmonic effects don't only arise in nanoparticles; plasmons play an important role at many length scales. However, chemists take advantage of plasmons in nanoparticles - usually of gold or silver - to achieve optical effects as well as promote catalysis. together and a lattice starts to form. Dr. Mirkin's group has become expert at using DNA to create very carefully spaced superlattices of gold nanoparticles. Strands of DNA bind readily to gold nanoparticles to create what's been termed a spherical nucleic acid. But, the DNA isn't complete; "sticky ends" of DNA half-strands are left hanging. These sticky ends can bind to sticky ends on other spherical nucleic acids and hook the spherical nucleic acids together. By changing the length of the DNA strands, Mirkin's group can change the distance between the gold nanoparticles. In the latest collaborative paper between Dr. Mirkin and Dr. Schatz (Michael B. Ross, first author), the authors study the effect that spacing out the gold nanoparticles has on the plasmonic properties. They allow that the composite material can interact with light in two ways: plasmonic absorption, as described above, and scattering. Using a model called effective medium theory, they predict that sparse lattices of gold nanoparticles will not scatter light, and the only optical features observed will be plasmonic absorption. Furthermore, their model shows that for dense superlattices with lots of gold nanoparticles packed close together, the refractive index of the material changes, and scattering becomes dominant. They also suggest that the mesoscale (micrometer-length) shape of the particles controls the refractive properties. Experimentally, the superlattices were prepared in both micron-sized powder form and also as ~150 nm thin films. The thin films aren't thick enough to have a mesoscale structure, so the authors compared how samples of both geometries interact with light. They also quantify the way gold nanoparticle superlattices of increasing gold density differ from one another in both geometries. The findings show that features for thin films are unchanged regardless of the gold content, showing only plasmonic absorption. Large superlattice particles, on the other hand, scatter light at longer wavelengths when the gold content is higher. These experimental results are exactly in line with what the authors' model predicted, so they turn around and use the model to make some predictions on how mesoscale particles of differing shape, or crystal habit, will scatter light. The simulations uncover a shape dependence and a gold density dependence on optical features for five different systems. As light passes through one of the superlattice particles, it can interact with individual gold nanoparticles through plasmonic absorption. 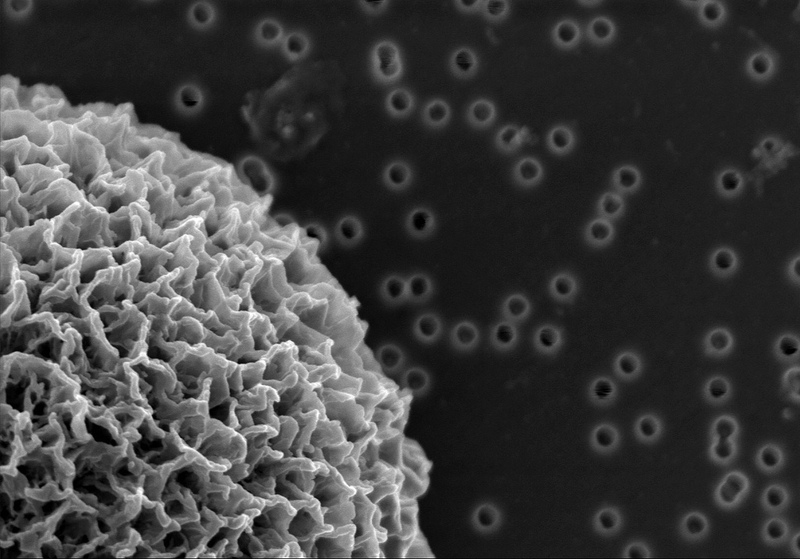 But, as the gold nanoparticles get closer and closer together, a different mechanism starts to dominate. When the gold nanoparticles are close together within the superlattice, the effective refractive index of the whole material goes up. That means that light actually moves more slowly through the superlattice than it does through the surrounding medium. When the light slows down, it changes direction, and that's what gives rise to scattering. You've seen this before - it's the same reason that stuff underwater looks like it's in a different position from above the water than it does from below. Scattering isn't observed in the thin films because light doesn't travel through them for long enough for the change in direction to become apparent. For the future of optical devices, this realization is a big deal. Researchers are trying to dream up ways of customizing materials to achieve various optical effects. Mirkin and Schatz's paper connects the wavelengths scattered by a material to its internal geometry and also to its crystal habit. Looking at this work, one can imagine dialing in specific optical responses that can't be replicated by any material in nature. That would make really tiny particles into really big business.